Results from the first year of a two-year study that is attempting to discover why some adult salmon that arrive at Bonneville Dam are not accounted for at McNary Dam, an upstream journey of 146 river miles, found that survival of radio tagged adult chinook and sockeye salmon is below performance standards set in the Federal Columbia River Power System Biological Opinion for salmon and steelhead. In 2013, of 400 adult sockeye salmon and 900 spring-summer chinook salmon with both radio and pit tags beginning at Bonneville Dam, 83 percent of sockeye salmon, 69 percent of adult chinook salmon and 83 percent of jack salmon made it past McNary Dam. However, fish that are harvested and those that enter tributaries, among other causes, complicate this estimation. Using radio tag technology, the study attempts to discover the fate of those salmon that aren't detected at McNary Dam. Among the potential sources of mortality or unaccounted for loss of adult fish, according to the report, are legal and illegal harvest, predators, natural mortality or mortality associated with fallback at dams, straying and high water temperature. "The work represents part of year one of a two-year study. The objectives are generally similar across the two years," said Matt Keefer, research scientist at the University of Idaho, and lead author of the study. "You need to be cautious about using the term 'missing salmon'. We simply could not account for their fate. Most likely, a good number of these were harvested but their radio transmitters were not returned to us. Others likely entered tributaries undetected, and some portion presumably died before spawning." This report represents one part of a large, integrated study, he added. The radiotelemetry data are being used to address a number of objectives, from fine-scale behavioral assessments at dams to the migration survival component described in this report. 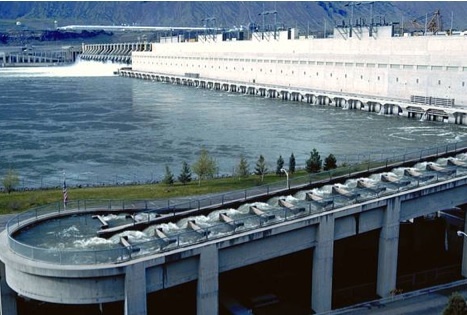 The draft report available in May 2014, "Reach Conversion Rates of Radio-Tagged Chinook and Sockeye Salmon in the Lower Columbia River, 2013," was conducted by researchers from the University of Idaho and NOAA Fisheries for the U.S. Army Corps of Engineers. In addition to Keefer, researchers include Chris Caudill, assistant Professor, University of Idaho, the study's principal investigator; Brian Burke, fishery biologist at NOAA-Fisheries Science Center in Seattle, a co-principal investigator, and staff scientist Kinsey Frick, research fish biologist. One of the information gaps that the BiOp requires to be assessed is the survival of adults to spawning grounds. "The data used to address this question are primarily derived from PIT tags, but radiotelemetry can help fill in some of the gaps - namely, you can use radio antennas in places where PIT antennas simply do not work very well, including dam tailraces, reservoirs, and some tributary areas," Keefer said. "We're using the radio data to help NOAA and the Army Corps fill in gaps about what happens to fish that don't reach spawning areas." 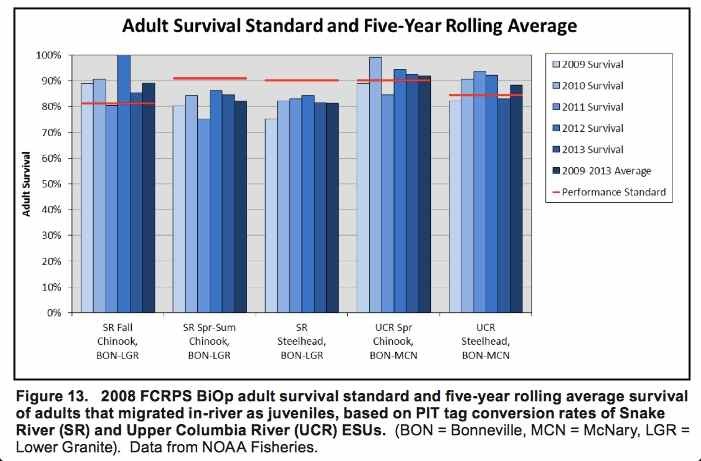 The minimum survival performance standard in the BiOp for spring-summer chinook salmon from Bonneville Dam to McNary Dam is 94.9 percent, according to Ritchie Graves, chief of the Columbia River Hydro Power Branch at NOAA Fisheries. The performance standard is 91.4 percent for Snake River sockeye salmon, which were listed as endangered in 1992. To break this down further, the performance standard for Snake River spring/summer chinook salmon to Lower Granite Dam is 91 percent and 90.1 percent for those fish traveling to mid-Columbia River dams. According to the report, for adults that don't reach their spawning grounds, self-reported mainstem Columbia River harvest rates using a reward program accounted for 2.8 percent of sockeye, 4.5 percent of adult chinook salmon and 0.3 percent of jack salmon. Tributary turnoffs or straying accounted for 8.2 percent of adult chinook salmon and 10.3 percent of jack salmon. No sockeye salmon were detected as strays. That leaves the unaccounted for fish downstream of McNary Dam at 13.5 percent of sockeye, 17.7 percent of adult chinook salmon and 5 percent of jack salmon. There are several other potential factors that could explain what is happening with the remaining unaccounted for fish, according to the report. The data also show that survival differs among species and that jack chinook salmon generally survived at higher rates than adult chinook salmon. Survival for all salmon was the lowest between Bonneville Dam and The Dalles Dam, the reach with the highest fisheries effort. Survival was highest between John Day Dam and McNary Dam. Fallback downstream over the dams is associated with lower survival, especially at Bonneville Dam. Fallback salmon may be at greater risk of predation at that location due to the presence of California and Steller sea lions in April and May. Late migration timing may be hazardous for salmon. For example, later migrants may encounter warmer water temperatures. Other studies have shown a strong correlation between warm water and mortality in sockeye salmon. In addition, survival for chinook salmon declined through the season as water warmed. There is little evidence of timing effects on jack salmon, according to the report. The researchers will expand on their analyses in the second year of their research.